Measures both application and removal torques of screw caps and closures on their containers. • Certificate of traceability to the National Bureau of Standards with each unit. • Displays torque in 5 different units: Lb.-in., Oz.-in. Lb.-ft., Kg.-cm. and N-m. (Both Metric and British). • Multiple peak hold mode. • Display torque is held on screen for easy viewing until next test. • Collect and store test values. Download to a printer or PC for later analysis. • Lexan display panel for easy use and cleaning. • Downward and upward pressure do not affect the electronic torque meter as it would a mechanical unit. • Stainless steel bottle clamping mechanism quickly and easily adjusts from vials to gallon containers. • Handles all container styles, shapes and materials. • Handles all styles, materials, shapes and sizes of closures, including child resistant and tamper evident. • Suitable for sanitary environments. • Comes standard with built-in battery charger. • Quality, rugged, stainless steel enclosure. • No springs or internal moving parts. 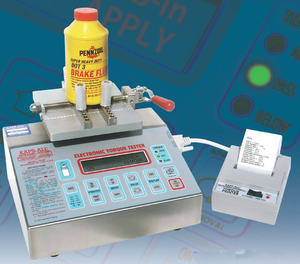 • Accurate, consistent operation, minimizes testing error, optimizes quality assurance. • Non-destructive testing eliminates waste of closures and product. • Audible and visual (LED) indicators assist in ease of operation. Three indicator lights provide for rapid visual test results. • Can also be used as a basic torque tester without statistics and indicator lights. • Special torque ranges - Microcomputer is preprogrammed to accept one of (3) different torque ranges for any special application you may have. • Complete calibration kit allows calibration to be done in your plant. The built-in computer automatically prompts and instructs operator through the calibration sequence using the integral LCD screen. • RS-232 software package interface for computer, printer or terminal. • Dot matrix Impact Printer with RS-232 interface. Power supplied from Torque Meter through the RS-232 cable (included). Use your mouse to click and drag left or right. Disclaimer: Machines shown in videos and photos may contain optional accessories.